Aneela Hoey graduated from Winchester School of Art with a BA (Hons) degree in printed textile design, in 1994. She has worked in design studios in both London and New York as well as freelance. After getting married she took a break to raise her two daughters, now aged 7 and 10. She found her back to textile design through her love of quilt making which led her to begin designing the kind of fabrics she wanted to use but couldn’t find. Aneela is also a keen embroiderer and produces her own embroidery patterns. 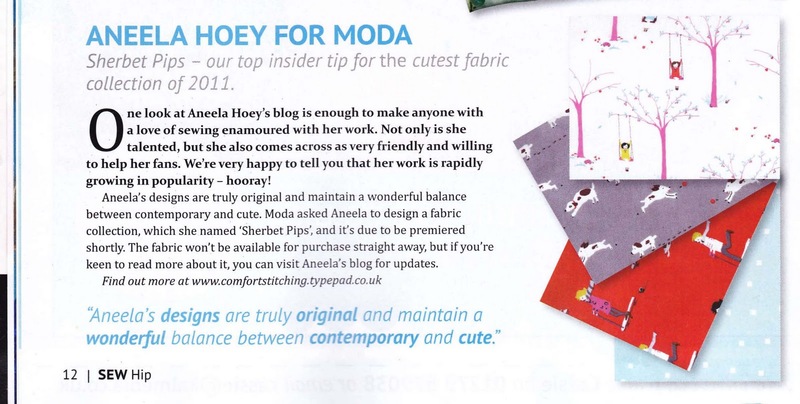 Aneela’s introductory line of fabric for moda is Sherbet Pips. It will be available at your favorite quilt store in April 2011. Follow Aneela’s blog, comfortstitching for inspiration, projects, tutorials, quilt a-longs and more. The Pickledish is her most current Quilt A-long. Aneela is also one of the editors of Fat Quarterly, a new e-magazine. This article is from Sew Hip. I know it is tough to read but thought I would share with you the bottom sentence. Welcome Aneela to the moda team! Aneela shared a sneek peek on her blog before market so it was her line I was most excited about seeing there. Moda did a great job with her designs and I went crazy ordering the Pips and dogs and scarfs and square dots in almost every color. I was happy to see a new designer join your team with a fresh look. This range is very gorgeous and I am more excited about it that I have been about any fabric range in ages.